I learned about a fun pattern for dishcloths a couple of weeks ago. (Thanks Ann!) I don’t usually make dishcloths too often because I get kind of bored with them, and I am not crazy about knitting with the dishcloth cotton. Well, this pattern inspired me. It’s called Sinkmates on ravelry. The designer, Lorilee Beltman, is selling the pattern for $2.00. She has donated all the proceeds from the pattern to Special Olympics and has raised $2,500 so far. That’s a lot of patterns! They are a lot of fun to knit. You begin with an i-cord. It goes very quickly. Then you pick up stitches with the main color. 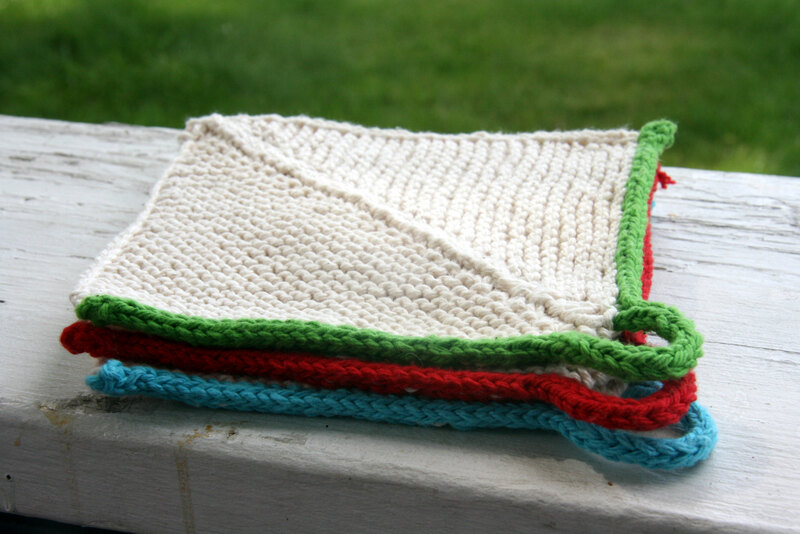 Next you follow the pattern to create the remainder of the dishcloth which eventually decreases down to 5 stitches. I love patterns that decrease and decrease to the finish. The only thing that I didn’t like was picking up the stitches from the i-cord. This was difficult and hard on my hands. Finally after I was almost done with the 3rd one, it occurred to me that I should knit the i-cord with a larger needle. So I did. 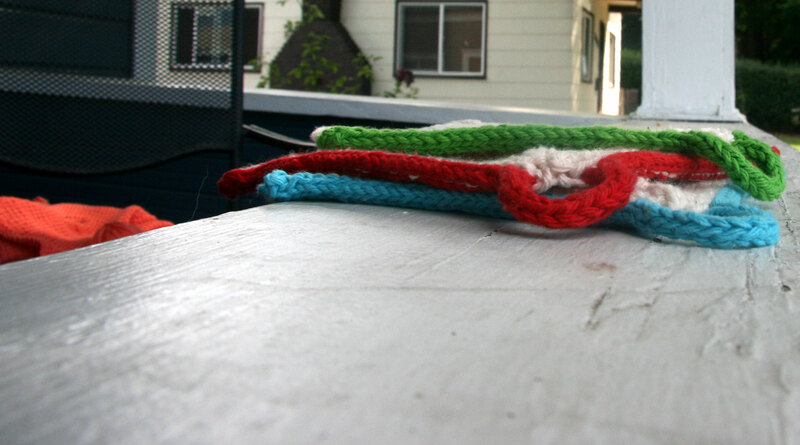 I knit the i-cord with size 8 needles and then picked up with size 7 needles. This worked awesomely. No more hand pain or frustration. I like to take pictures of things from goofy angles hoping I will get a cool result. I didn’t get there this time. 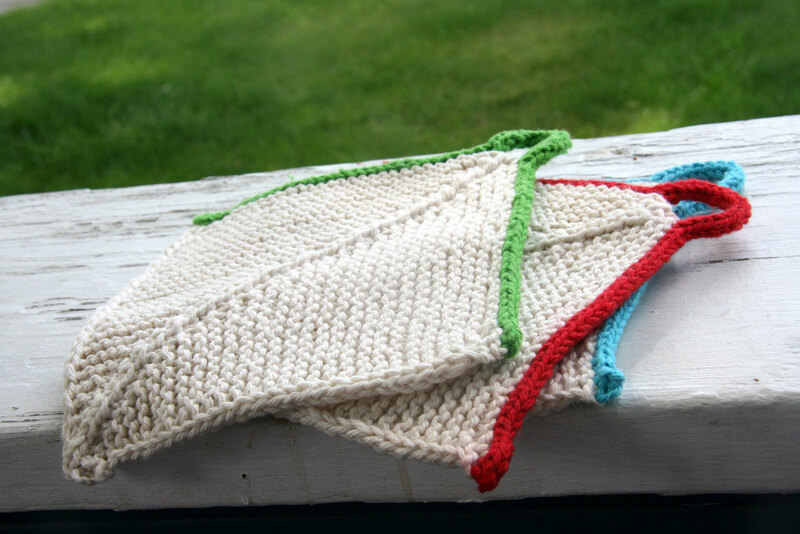 These go very quickly and they are great to knit while traveling or while sitting in front of the tv in the evening. I also love that she created this cool pattern and then has donated the proceeds to a great cause as well! I am with you and usually am not a fan of working the cotton, but with these beauties you may have changed my mind. A great pattern and a great cause, that sounds like the perfect reason to dive back in. Thanks! It is a great pattern and a great cause. I hope you try it out! 🙂 I didn’t even mind the cotton!